The PL�T seminar is a major event devoted to metal sheeting. 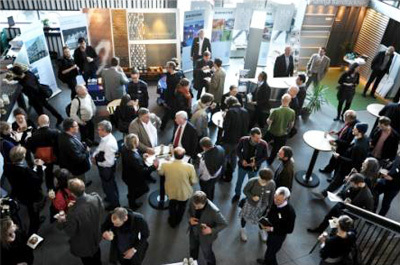 This year the seminar is entitled PL�T11 and will be held in Stockholm on February 2, 2011. The purpose of the seminar is to highlight sheet metal facades and metal’s architectural potential, showcasing unconventional ways of utilizing it. Every year some 300 architects, contractors and consultants attend the seminar. 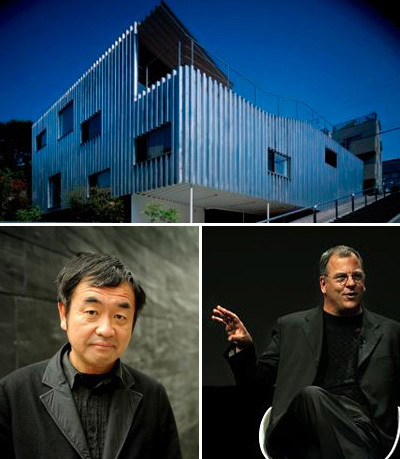 Previous key speakers have been Kengo Kuma, William Zahner of A.ZAHNER COMPANY, Dominique Perrault, Jacob van Rijs of MVRDV, Bruce Nichol of FRONT INC and Ryue Nishizawa of SANAA. The organizers of the PLÅT seminars are Plåtforum, an association with leading companies within the field: Rheinzink, Luvata, Plannja, Heco Nordiska and Bevego. They naturally represent the materials most commonly used in sheet metal construction: steel, zinc, copper and aluminium. These materials and their characteristics are exhibited in specially designed stands located outside the seminar hall. An additional partner is Plåtslageriernas Riksförbund, the professional organization representing Sweden’s sheet-metal workers with close on 1000 member companies. PLÅT11 is the fourth PLÅT seminar to be held. See you in Stockholm in february 2011. In Malmö we were treated to a lecture by this year’s Pritzker Prizewinner, Ryue Nishizawa, SANAA. 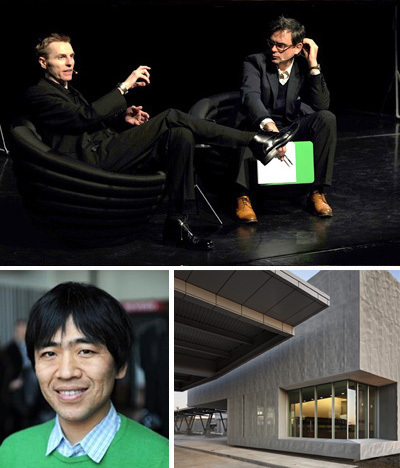 In his typically humble Japanese manner Ryue presented several topical projects, including the Louvre-Lens museum and the recently opened Rolex Learning Center. He repeatedly stressed his obvious motto of “Keep it simple”. The fact that sheet metal work so often figures in SANAA’s work is explained by Ryue’s appreciation of metal’s combination of reflection, lightness of expression and strength. His personal favourite is aluminium. He appeared to view his winning of the Pritzker Prize with relaxed composure, and this despite the fact that SANAA win only one out of every thirty contests. “I believe our proposals are too simple,” Ryue indicated. But with the final product before us we could appreciate that the simple was in fact what was tricky. There is generally a masterpiece lurking in achieving almost nothing – at least if that nothing comes from Ryue Nishizawa and SANAA. FRONT and Bruce Nichol are the company and the person behind the technical facade solutions at, for instance, SANAA’s new Museum of Contemporary Art in New York. Part of the task there was to create the right tonal shade on the bright aluminium facade, but first and foremost to scour the world for an environmentally friendly processing method that gave the desired result. Bruce gave a detailed insight into the problems and solutions involved in a number of exclusive facade projects where his job has been to realise the architect’s intended design idiom and functions while at the same time paying regard to the metal’s specific characteristics. FRONT’s knowledge and experience in the field of metals and facades are unique in the world, and among those who have made use of their skills are Renzo Piano, Herzon & de Meuron and Zaha Hadid. In Gothenburg participants to the seminar were able to share in Kengo Kuma’s restrained and deferential approach both to architecture and to life itself, an approach which inspires the greatest respect for his work. The familiar expression “necessity is the mother of invention” acquires a completely new connotation after following a lecture in Kumaist architecture. The focus is on locally available construction materials, whether they comprise plastic, stone, paper, sheet metal, bamboo or glass. Every project brings with it its own special requirements, and he constantly seeks out fresh challenges to feed his own inspiration. Time-consuming indeed, but this is his way of working and nothing else will satisfy him he claims. William Zahner brought to his listeners a number of intriguing and surprising experiences, and invited them to take part in a creative thought process on the theme of sheet metal’s vast potential. His company is on the one hand a family heirloom possessing an inherited bank of acquired knowledge and on the other a gigantic playground in which computers and various sheet metals provide the basic materials. Nothing is impossible. With their distinctive approach whereby the commission is always focused on the architect’s wishes, Zahner’s firm stands out as the dream machine for everyone desiring to include sheet metal in their architecture. Zahner works for Frank Gehry, Herzog & de Meuron and Daniel Libeskind, among others. At the first PLÅT event, held in Stockholm, Jacob van Rijs, MVRDV, took the stage. With infectious enthusiasm and humour he shared with us his thoughts on techniques behind the architectural firm’s mobile housing, pig cities, container buildings, unusual material combinations and surprising colour selection. He made it clear that the future by no means needs to be as we expect. Dominique Perrault, a major figure and monumental designer, visited Sweden for the first time. 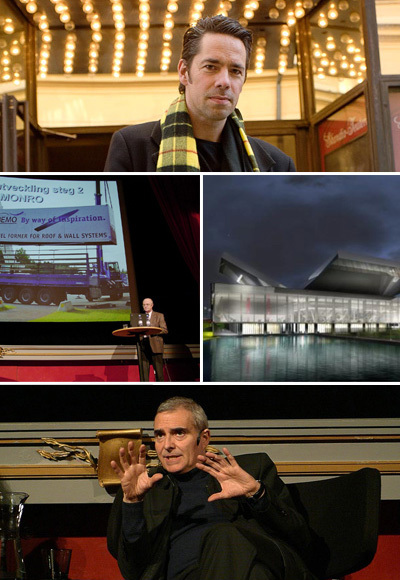 Being the leading innovator he is in the fields of metal facades and metal weave, his presentation included two ongoing projects demonstrating unique and exciting use of metals – the Markiinsky II Theatre in St Petersburg and the Olympic Tennis Center in Madrid. Lars Ingvarsson, Ortic, doctor of engineering and inventor, was for most of us an unexpected and welcome acquaintance. He lectured on his new 3-dimensional roll-forming technique for producing sheet metal items in curved shapes, a technique that offers new potentials for sheet metal in architecture and one that has rescued the construction of numerous Olympic arenas. In addition he gave fresh meaning to the concept of just-in-time with his creative solutions for sheet metal production in mobile containers.